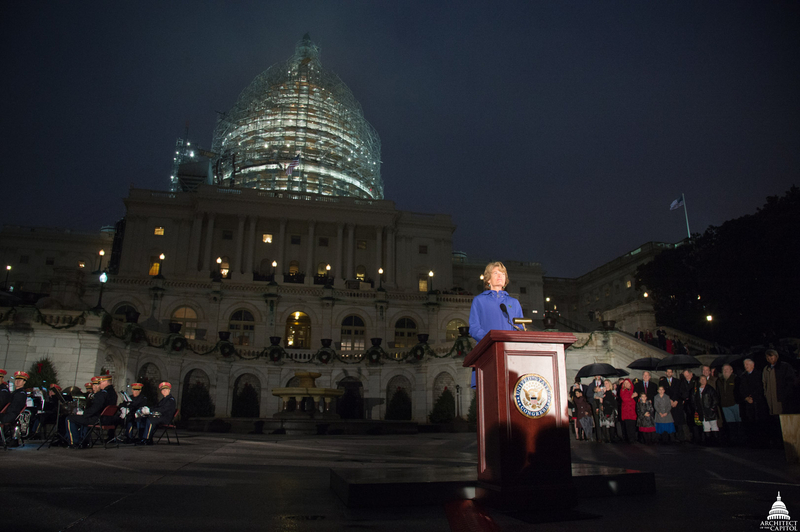 The mild and misty December air crackled with excitement as the Architect of the Capitol, members of Congress, congressional staff, Capitol Hill neighbors and tourists gathered on the West Front Lawn for the lighting of the Capitol Christmas Tree. The majestic Lutz spruce, selected months ago by the Architect of the Capitol (AOC) and the U.S. Forest Service, completed its adventurous and historic trip from the Chugach National Forest in Alaska to Washington, D.C., on November 20. After the tree's arrival, the AOC Capitol Grounds team spent several days positioning it on the Capitol's West Front Lawn and decorating it with thousands of LED lights and ornaments sent from Alaskan communities. The 74-foot tree traveled more than 4,000 miles by truck and cargo ship – the first U.S. Capitol tree to travel by sea. During its journey it weathered gale-force winds, attended community celebrations along the delivery route; and, like most people who visit Washington, D.C., it sat in traffic. Master of Ceremonies and Architect of the Capitol Stephen T. Ayers greets the crowd. As dusk fell across the West Front Lawn tonight, Master of Ceremonies and Architect of the Capitol Stephen T. Ayers stepped to the podium. The warm strains of festive music from the United States Army Band faded and the ceremony began. 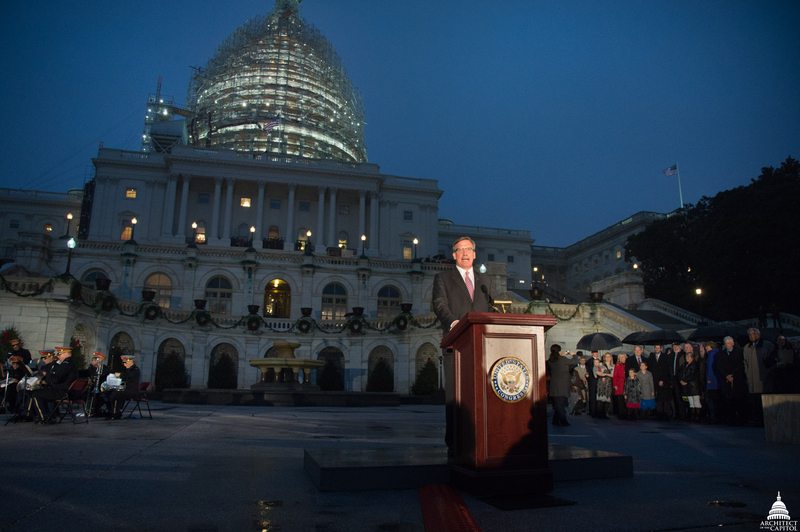 "I want to thank everyone involved in supporting the 2015 Capitol Christmas Tree. This incredible tree and the thousands of handmade ornaments on it are a treasured gift to us from the people of Alaska," said Ayers. Leader of the Alaska delegation, Senator Lisa Murkowski. In attendance to witness the tree lighting were members of the Alaska delegation, Senator Lisa Murkowski, Senator Dan Sullivan and Representative Don Young. They proudly joined 10-year-old Anna DeVolld of Soldotna, Alaska. DeVolld entered and won a statewide essay contest sponsored by Murkowski explaining why a Christmas tree from Alaska is special. 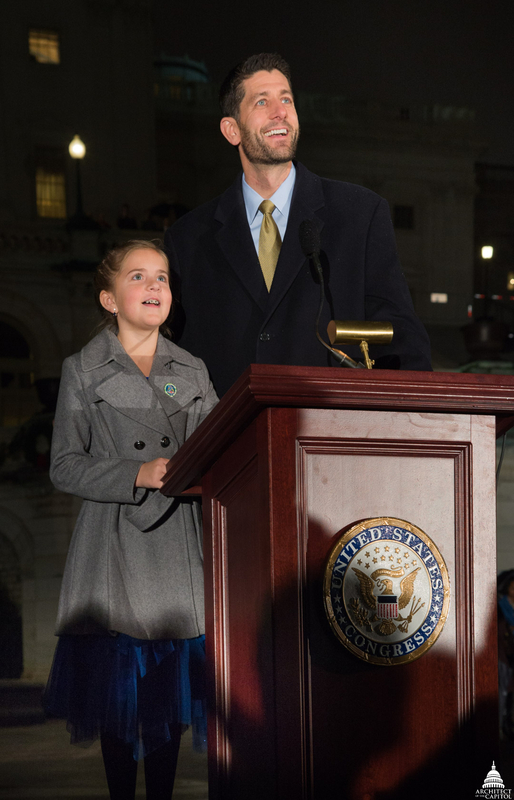 Anna DeVolld from Alaska with Speaker Paul Ryan gaze at the tree. At the designated time, DeVolld stepped forward with Speaker Paul Ryan. Together, they pushed the button to light the tree. The band's familiar notes of "O Christmas Tree" joined the audience applause at the sight of the magnificent tree. In the words of DeVolld's winning essay, "The tree lights display the Aurora Borealis, shimmering across the heavens. Tinsel resembles the Alaskan glaciers that sparkle day and night. Ornaments represent the wild Alaskan creatures that dot the forests, sky, and seas. A tall, colorful Christmas tree mirrors the towering Alaskan mountains. Evergreen needles symbolize the Alaskan's adventurous spirit that never fades. Strong spruce branches stand for Alaskan's freedom that survives despite troubles. Alaskan Christmas trees are special..."